Charity:Water is a non-profit organisation working towards bringing clean and safe drinking water to people in developing nations. The organisation has produced a Google Map to show where water projects have been completed. 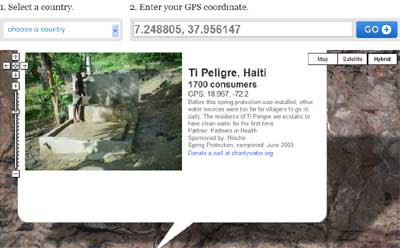 When a water project is completed, local field partners report back to Charity : Water with photographs and GPS coordinates and the project is added to the map. It is possible to search the map by coordinates or by country. To read about an individual project just click on any of the water-well shaped map markers.